CLIFFORD C. COWLES, the only son and oldest child born to DELBERT PHILANDER and Minnie MAY HALL COWLES, was born on May 7, 1889 at the family farm in Eden Township, Decatur County, Iowa, and died at the Decatur County Hospital, Leon, Iowa on Sept. 22, 1985, aged 96 years, 4 months and 15 days. He received his schooling at the High Briar county school. Farming was his occupation and he was a good mechanic and carpenter. For many years he and his father owned and operated a threshing machine. They also had a sawmill on the family farm. As a small lad, he helped his grandfather and father in the operation of a flour mill located on the family farm. CLIFFORD was baptized on Dec. 12, 1908, a member of the New Salem Baptist Church. He was a 50-year member of the Modern Woodmen of America. He served as a Trustee on the Decatur County Hospital Board many years; active in the Red Cross organizations and served on the Decatur County Fair board. On July 25, 1909 he was united in marriage to GRACIE FLORA DALE by Pastor CYRUS DEYONE. To this union four children were born. 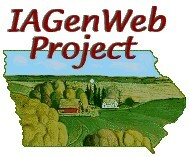 Their home was on the family farm until he retired and moved to Leon, Iowa. For the past two years, Clifford has resided at Westview Acres, along with his beloved wife, until her passing on March 30, 1985. On July 25, 1984 they celebrated 75 years of married life together. He was preceded in death by his wife; an infant daughter who died at birth; his parents; and sister, EDYTHE. Survivors include his son, DALE and wife, LAVERA, Leon; two daughters: VERA VANDEL and husband OTIS, Leon; and VERNA MCKEEMAN and husband, RAY, Gering, Ne; grandchildren; MARVEL PAYTON and husband, LYNN, Leon; VICKI BENZ and husband, DUANE, Arkansas City, Ks. ; JERRY MCKEEMAN, San Francisco, Ca. ; great-grandchildren; TIM PAYTON in the U. S. Navy stationed at Alameda, Ca. ; TERRY PAYTON, Leon; and TARA and TRACIE BENZ, Arkansas City; sister, CLARICE WARRIOR, Afton, Iowa; three sisters-in-law; GLADA WAFFLE, Westview Acres; MININE LEEPER and MINNIE DALE, all of Leon; nieces, nephews, cousins and friends.